Contact Hoofbeats with Heart at 602-421-7718 for available openings for Occupational, Physical and Speech therapy, Equine therapy at the Center or traditional in-home therapy. During this intake contact the process and fee structure will be outlined. Hoofbeats with Heart accepts referrals from the State of Arizona Department of Developmental Disabilities, other agencies, private insurance, doctors, and therapists and self referral. 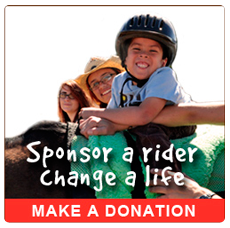 Hoofbeats with Hearts works with each family to ensure a child or adult in need of therapy receives it. To begin the enrollment process, download the Rider Application and Registration forms and complete the information requested. If you are working through the Arizona Department of Developmental Disabilities we request you call your Support Coordinator to have the authorization sent to Hoofbeats with Heart. Once Hoofbeats with Heart receives authorization to provide services from the Arizona Department of Developmental Disabilities, therapy can begin.